Over two days Keller Easterling and OfficeUS will discuss forms of action and intervention for architects and spatial practitioners. The open workshop will examine the global implications of information flows, outsmarting regulations, and spaces beyond reach of government. The presentation will focus on An Expanded Activist Repertoire in Infrastructure Space (gossip, rumour, exaggerated compliance) as a set of strategies suggesting engagement and resistance in spaces that exceed national, governmental and economic borders. Followed by roundtable discussion with OfficeUS Partners and audience. Using the collected terms from the morning discussions the group will identify, define and evaluate their performance. In this session participants will use images, diagrams, code, websites, words and drawings to transform these terms into new active forms for global offices worldwide. Keller Easterling is an architect, urbanist, and writer. Her latest book,Enduring Innocence: Global Architecture and Its Political Masquerades (MIT, 2005), researches familiar spatial products that have landed in difficult or hyperbolic political situations around the world. The book won Yale’s Gustave Ranis Award for the best book by a Yale faculty member in 2005. Her previous book, Organization Space: Landscapes, Highways and Houses in America, applies network theory to a discussion of American infrastructure and development formats. 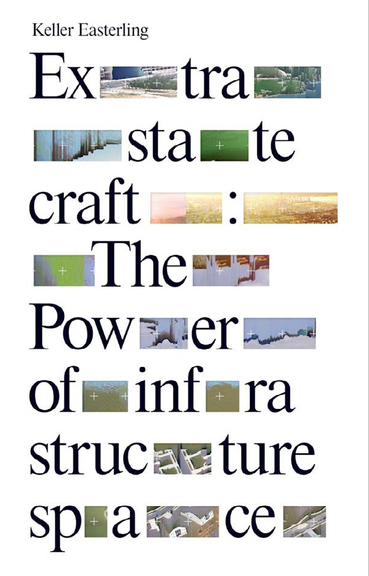 The recent ebook The Action is the Form: Victor Hugo’s TED Talk (Strelka Press, 2012) previews Ms. Easterling’s forthcoming book, “Extrastatecraft: The Powers of Matrix Space” (Verso, 2013), which will examine global infrastructure networks as a medium of polity. Ms. Easterling is the coauthor, with Rick Prelinger, of Call It Home, a laser disc history of suburbia, released in DVD in 2013. She is also the author of a book and database titled American Town Plans. On the Web, Ms. Easterling has published research installations such as “Wildcards: A Game of Orgman” and “Highline: Plotting NYC.” Her work has been widely published in journals such as Art Forum, Domus, Grey Room, Volume, Cabinet, Assemblage, Log, Praxis, Harvard Design Magazine, Perspecta, Metalocus, and ANY. Her work is also included as chapters in numerous publications. She has lectured widely in the United States as well as internationally. Ms. Easterling’s work has been exhibited at the Storefront for Art and Architecture, the Rotterdam Biennale, the Queens Museum, the Architectural League, the Municipal Arts Society, and the Wexner Center. Ms. Easterling taught at Columbia prior to coming to Yale.